Due to the mobility of its users, GSM systems are vulnerable to an unauthorized access and eaves droppings when compared with the traditional fixed wired networks. The main idea of this project is to develop an application device in order to secure mobile banking over unsecure GSM network. It is important to mention that mobile banking is a term that is used for performing balance checks, account transactions, payments, credit applications, and many other online applications. Unfortunately, the security architecture for cellular network is not entirely secure. As a matter of fact, GSM network infrastructure is proved to be insecure. Many possible attacks are documented in literature. 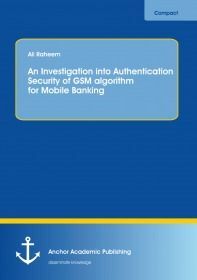 For security was never considered in the initial stages, the sending of protective banking information across an open mobile phone network remains insecure. 1. Security issues in each level of the mobile network architecture. 2. Messages and signals exchanged between user’s cellular phone and mobile network at each level. 3. The overall security architecture of GSM flaws. 4. Some existing security measures for mobile transactions. 5. The current security within SMS banking and GPRS banking. Finally, two folded simulations in MATLABT were performed using OFDM which is a broadband multicarrier modulation method that provides a high performance operation to transmitted and received data or information.